This is one of those games I always wanted to play but never had the chance as a kid. It Quite different from the first game as you needed to do more then just run, jump and shoot. I did manage to play an old arcade system when I was a kid, so when I found an old SMS copy years later I was happy they managed to keep the same feel. They did a good job making it feel sort of like the arcade version, though making sure to keep the game original. Fighting monsters gives you two things: points and gold. The more points you get the more live to receive, and for course the gold is for buying better equipment. This game did a good job with the whole 'action adventure' idea. The game also takes a lot of trial and error deciding when to buy what equipment. You also have to be on the look-out for secret doors bosses holding better weapons. The game will keep you busy if you like exploring. Crisp clean pixels with lots of colour and low to no glitching. This game does a good gob working the colours of the Sega's engine. Your character also changes his look when he gets better equipment. Monsters sometimes have simple movement patterns but each sprite is really well animated, complete with wiggling death pose! The game does a good job showing the animation power of this system. They also did a good job making it feel sort of like the arcade game. Nothing monumental but the tunes are catchy. Even the dark spooky music has a friendly feel to it. I do remember the arcade had better music quality but the music never got annoying. I did have a problem with a low life alarm being quite loud and drowning out a lot of other things. Your man starts out a little slow. You do however get shoes that let you speed up and jump higher. This does effect how well your character can navigate though the game. Other then that the game responds well though I find it hard to mess up such simple controls. 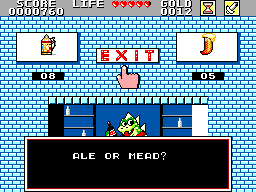 If you can play a Mario or Mega Man game it's quite the same, but with a sword. Well despite always having to start from the beginning the game does have a lot to keep to playing. Trying to find all the secret doors and other such things makes it interesting. Most of the swords have to be found this way. 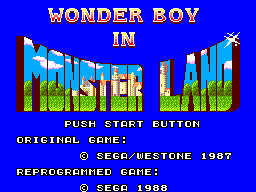 If your a fan of Wonder Boy this is a game worth picking up. I would actually say this game is more Medium to hard level of Difficulty, though not impossible to play for a novice player. I was actually quite pleased with this game even after all this time. Now for those who have played the arcade version I tried to say it's LIKE that version, though they really are two different games. 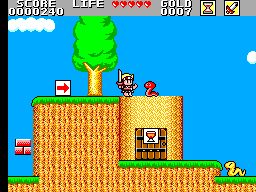 Wonder Boy also looks far better in a suit of armour instead of a loin cloth that's for sure! If you have not tried this game out it's worth a shot because games like this makes keeping that old SMS around worth it!